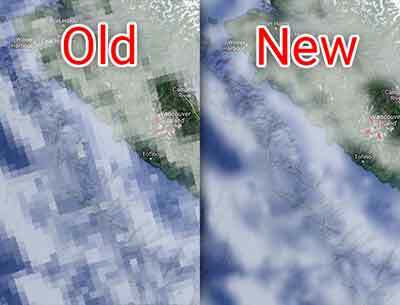 Today I’m happy to announce the release of The Big Map Update, aka “the clouds are back in the PNW”. Here’s hoping that all of my Cloudy Night users have clearer nights than me ahead! 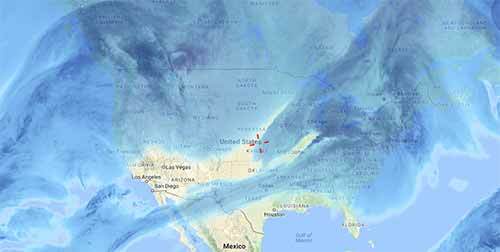 The Canadian Meteorological Center produces a high resolution forecast covering North America. Clear Sky Chart paved the way for building forecasts off of Allan’s data, but even with thousands of locations covered it only represents a few percent of the data available. Astrospheric is the only service that lets you dynamically generate a forecast from Allan’s data anywhere within the forecast region. So if you’re more than 10km away from a Clear Sky Chart location, then more relevant data awaits you on Astrospheric. Hour-by-hour forecast graphics are convenient but they can’t help you see the big picture. A quick glance at a map will show far more information than you could ever get from a simple point forecast. The data served on Astrospheric, and pretty much every weather website around, has already been paid for with our tax dollars. Although my time and server time aren’t free, there are more expensive hobbies I could have taken up. Also, please keep in mind that building Astrospheric is an after-work pastime for me, so dial your expectations accordingly. Astrospheric now produces hourly map imagery for Clouds and Transparency. This required significant performance improvements to the Astrospheric core engine, and will allow for more great imagery in the near future. Cloud imagery has been upgraded with bilinear interpolation. This averages data from the nearest 4 data points to decreases visual distortion. Special thanks to my brother Andrew, who helped with the mathematical transforms necessary to perform interpolation across the non- standard data grid in real-time. Map controls have been updated to make browsing the map data faster and easier. Click on any hour in the detailed forecast to update the cloud map, or hit play and watch the clouds roll by. The full-screen map now comes with a new scrubber tool to jump to any hour. Also, a play button to animate the map imagery has been added to every map layer. More satellite data is now available. Water vapor and Visible imagery are now joining Infrared and are being updated every 30 minutes. A note on bandwidth. While it’s okay for Astrospheric to stream out gigabytes of data every day, most people don’t want their home computer or phone to download that much. This update makes special considerations for this. 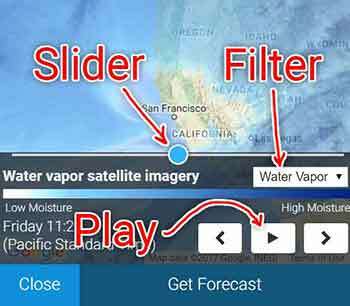 By using the forecast or map scrubber, you can load only specific layers. Be warned, the “play” button will download all the images for whatever layer you’re viewing to ensure a smooth animation. Finally, here is the upcoming roadmap which a few folks have asked me for. 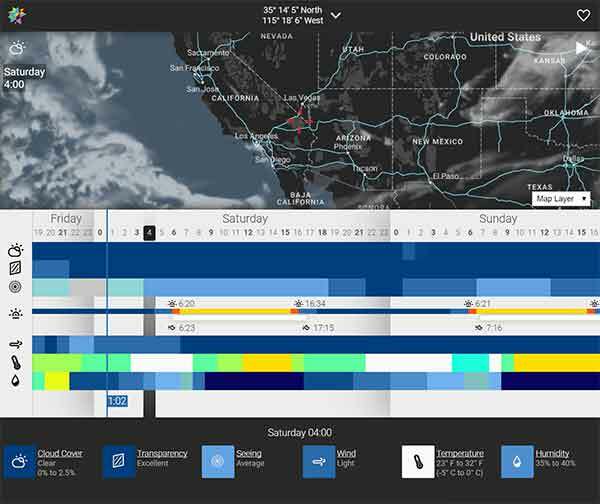 Forecast visual updates. The current forecast was designed for familiarity, but there are better ways to view temperature, wind, and humidity that can be more universally understood. Also, humidity will be switched out for dew point temperature in the near future. An experimental transparency forecast that merges aerosol optical depth. This upgrade will create a transparency forecast that takes more than water vapor into account as is the case today. Experimental seeing forecast which will produce hourly seeing data instead of once every 3 hours which is the case today. Notifications! This is basically the top piece of feedback coming in and I hear everyone loud and clear. Notifications require pre-computing and interpreting forecast data, which costs server resources (aka money), so I’m working on ways to make this as efficient as possible. There is a chance this will be an annoying in-app purchase to cover the server time. More frequent forecast updates. Once the experimental transparency and seeing forecasts are proven out, Astrospheric will begin updating 4 times a day instead of just twice. Thanks again for using Astrospheric and providing valuable feedback. Together we’re building the most advanced astronomy weather service available with lots of great updates still to come. Astrospheric is *the* premier forecasting app. Awesome, glad to hear you're liking it! Apologies if anyone has run into loading problems. There were a couple of issues with the new update that I wasn't able to identify until they were put under load. Should be fixed up and running smoothly now! I was able to use some of the new tools I created over the holiday weekend to generate a cool time-lapse from the data being gathered by the Astrospheric service. This is 5 days of water vapor flowing over North America. Not exactly sure how I'll integrate these in the future, but worth sharing because it's pretty cool to watch. Cool but not cool. That clearly shows why imaging time has been so sparse this winter. This app is awesome!!! Man I wish I had this before I got rained out of the solar eclipse back in August... I might just have made the extra couple hours into Nebraska. Oh well. Thank you so much for this service and putting your personal time into it. I'll be kicking a few bucks your way. Just a comment on your signature. "You know a real friend? Someone you know will look after your cat after you are gone." I don't recall that one. Love the quote and William S. Burroughs in general. Yeah, pretty to watch, but depressing to think about. I was hoping the PNW would get an easier winter, especially after last years. No breaks in sight. Awesome, glad you're liking it. I've had a few suggestions to add a donate button, but at this point I'm still under budget so don't worry about $ (although I do appreciate the offer ) It's surprising how cheap you can store and serve gigabytes of data on the internet these days! Hey, if people wanna give you money why say no? If you're good at something never do it for free... Isn't that what "they" say? I've gotten some feedback that scrubbing through data layers on the map is performing poorly (flashing, jittering, strange graphical issues) on some Android devices with this latest update. I have a hypothesis, but if you think you're affected please PM me (or respond here) with Android version and name of device. I'm hoping it's just a service update that can fix the issue. Apologies if this is impacting you, the map is (in my opinion) the most important part of the app! Edited by moab360, 05 December 2017 - 04:02 PM. Here's a couple nice features to think about. adding forest fire smoke and haze and aerosol extinction maps. Agreed. I think CA fire particulates are messing with seeing in the east. I just wanted to drop an note and say thank you for this app and all your hard work. I've been running the iOS version for the several weeks, or so, and I am very impressed. It is a one-stop-shop for astro-specific weather. I love it. Whatever you are doing, I encourage you to proceed. Edited by Thirteen, 06 December 2017 - 03:35 PM. Take a look at the Aerosol Optical Depth maps available on the full screen map in Astrospheric (they're a bit hidden). There are 3 wavelengths of AOD extinction created twice a day. I consider them experimental right now and would love feedback on accuracy. Here's how you get to them, and what later this afternoon is forecasted to look like on the West Coast. You can definitely see the effects of the fires raging near LA! The data is standalone - meaning it is not (yet) incorporated into the overall forecast. I'd like to merge this data in with transparency forecast in the future, but there is some remaining work before I can get to that. Edited by moab360, 06 December 2017 - 04:59 PM. There is a lot going on on that page, typically we're asking for so much at a glance, that it's really information overload. you really have done a great job on Astrospheric! Might I also suggest that the droid app not hang up waiting on GPS if the user has it turned off? Maybe have it remember the last fix or use another method? That's a bad bug, thanks for reporting it! I'll get to fixing it as part of my next update. In the mean time, if you create a favorite location and set it as your default, then the app should load to that location right away without any GPS lookup. Thanks for your efforts on this app. It's a huge wealth of information for me. Even though I don't like it's forecasts much lately. That worked. 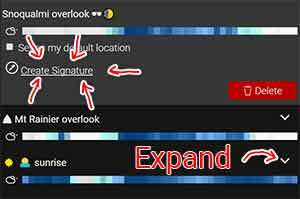 I missed the checkbox for default location first time around. The default checkbox is definitely hidden. I've needed to overhaul the functionality in Favorites for awhile now to improve usability. I'm hoping I can make progress on that over the holidays! Been using this for last couple weeks, its a great app and have found the forecast to be reliable (even when I didn't want to believe bad seeing). Thanks for your outstanding App, truly a great addition to the many MUST have astronomy software toolbox.